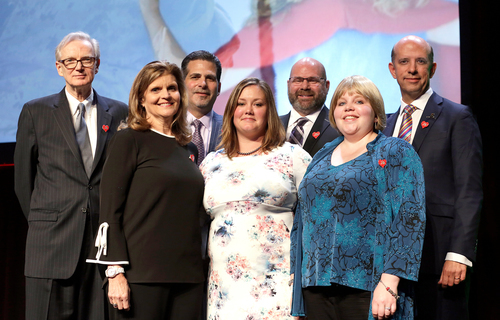 Photo: Back row, left to right, Joe Thompson, Hodinkee, Jeffrey Cohen, Citizen Watch America, Bill Luth, Signet Jewelers, Ltd., Seb Hobbs, Signet Jewelers, Ltd. Front row, left to right, Pam Mortensen, JFC Board chair, Pamela Heisler, Abby Richins. The evening began with a cocktail reception, followed by dinner and the program. During the program, the organization recognized Bill Luth, Executive General Manager/Executive Vice President, Kay Jewelers at Signet Jewelers and Jeffrey Cohen, President and CEO of Citizen Watch America. Guests were also treated to hearing updates from some of the children who appeared at previous Facets of Hope event including Abby, representing St. Jude Childrenâ€™s Research Hospital, who was present in 2004; Paige, representing Make-A-Wish America, who appeared and performed in 2005; and Pamela, representing the National CASA Association, who appeared in 2006. They shared amazing stories of their happy, healthy lives today and how the support of JFC helped them and others like them. The evening also included a watch give-away as well as a silent and live auction. Attendees bid on original paintings by talented artist Reena Ahluwalia and Shreya Mehta. A gold and diamond replica of the Star Wars droid BB-8 was also auctioned. For the third year in a row, Hallmark Jewelry sponsored an after-party featuring dessert, coffee and after-dinner cocktails and a tequila tasting. They were joined this year by Bulova who sponsored a performance by Calum Scott, British recording artist and contestant on Britainâ€™s Got Talent. Elizabeth Glaser Pediatric AIDS Foundation $ 425,000 and $ 375,000 to the National CASA Association. Also announced was a commitment of $ 75,000 to Make-A-Wish International for wish granting in India, and $ 25,000 to the Santa-America Fund. The organization is also setting aside $ 50,000 to reward in a local grants, social media voting campaign to be held later this year. In addition, the charity will make a donation to the Organization for Autism Research in the amount of $ 50,000. This is a new charity for JFC and start of a new relationship. Jewelers for Children was founded in 1999 by the U.S. jewelry industry with the mission of helping children in need. Since its inception, JFC has donated more than $ 55 million to programs benefiting children whose lives have been affected by illness, abuse or neglect through our charity partners St. Jude Childrenâ€™s Research HospitalÂ®, Make-A-WishÂ® America, the Elizabeth Glaser Pediatric AIDS Foundation and the National CASA Association. JFC also provides support to Make-A-WishÂ® International, and the Santa-America Fund.